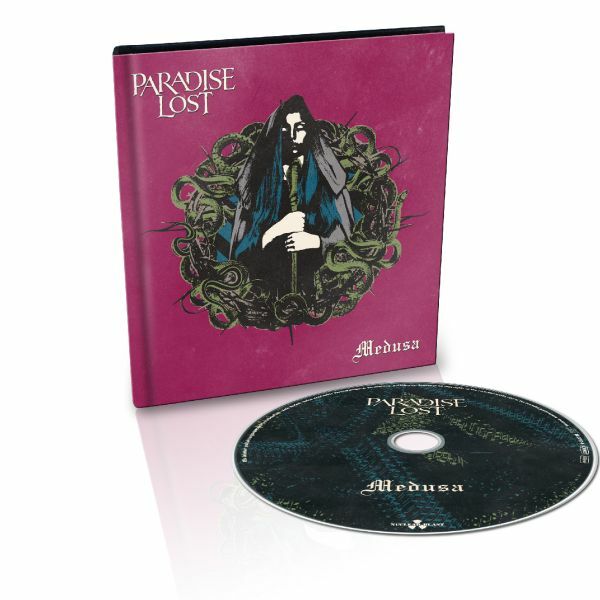 PARADISE LOST - MEDUSA LTD. EDIT. (DIGI) | Online Shop | Wizard LTD. Album: "MEDUSA LTD. EDIT. (DIGI)"
- NUCLEAR BLAST WINTER/ SPRING 2019 CAMPAIGN! ВРЕМЕННО НАМАЛЕНИЕ!! СЛЕД ИЗЧЕРПВАНЕ НА ОПРЕДЕЛЕНИТЕ КОЛИЧЕСТВА ЦЕНАТА СЕ ВРЪЩА НА СТАРОТО НИВО! Most people will know Medusa as the Gorgon from Greek mythology; she is the infamous beast with venomous snakes for hair who will turn anyone that dares to look into her eyes to stone. It is this hideous creature who PARADISE LOST have chosen to be the figureheard for their 15th studio album, as, from a philosophical perspective, she is more than simply a monster. Singer Nick Holmes started his research, intrigued to find greater meaning behind the symbol of Medusa and became particularly fascinated by the Gorgon’s nihilistic connotations. “Attempts to avoid looking into her eyes represent avoiding the ostensibly depressing reality that the universe is meaningless”, is an idea that was adopted by American novelist Jack London, and a thought that could have easily emerged from PARADISE LOST’s lyrics over the past 3 decades. »Medusa« will be PARADISE LOST’s heaviest full-length release of the past 15 years, melding crushing doom metal with Nick’s harsh death growls and raw organic sounds, heralding a new era of pure Northern misery. “I’ve always liked the expression &apos;the richest man in the graveyard’, as it sums up so much about life, our purpose for existence, and what all material possessions actually mean once we have gone. Yet, particularly in the West, adult life seems to be about accumulating meaningless things, or admiring other people that have accumulated more meaningless things than you have. In a famous film, someone&apos;s mum once said: ‘there&apos;s only so much fortune a man really needs... and the rest is just for showing off.&apos; I also like that expression”, states singer Nick Holmes. So abandon hope, all ye who listen here, and celebrate the beauty of ephemerality and nihilism – as long as you still wander on earthly soil.